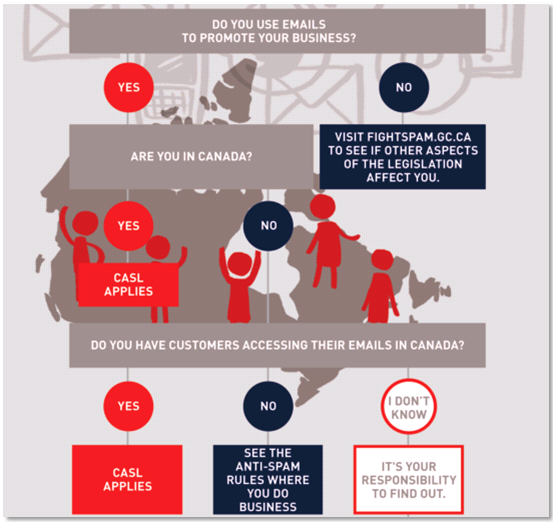 So far in our series about Canada’s Anti-Spam Legislation (CASL) we have covered the basics and commercial electronic messages. In this post we will cover the different types of consent and the burden of proof. There are two different types of consent that apply to CASL, express and implied. Express consent means an individual must take affirmative action to “opt-in” to your list willingly. Implied consent is when a relationship exists, but the recipient is added to your list without any affirmative action. With both types of consent there a is “burden of proof” that is required. This means that it is your responsibility to track, record, and document the information necessary to prove that you have consent to be contacting that person. Best practices include ensuring that all records of your compliance procedures and policies are maintained, and that proof of consent is documented and tracked. This information may support a due diligence defense at a later point in time if your firm is ever called into question. So let’s see this in action…. You collect someone’s business card and after meeting them send an email to confirm that you met them and they have requested more information or to be added to a list. This allows you to have the necessary information needed for the burden of proof. Someone fills out a form on your website with the intent of being placed on your list. A confirmation email would then be sent which requires a recipient to click a link to confirm they wish to be placed on the list. When they click the link, the date/time and IP stamp should be recorded. A person gives you their email address over the phone with the intent of being placed on your list. 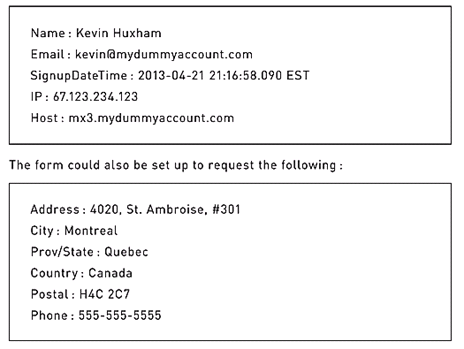 The same process of sending a confirmation email applies, but express consent could be proven if you recorded the conversation for each recipient. If someone expresses interest in your business as part of the sales process or enters their email address on your website to download educational material, they are to be considered “prospects” and implied consent is given to send commercial electronic messages for a period of 6 months only. 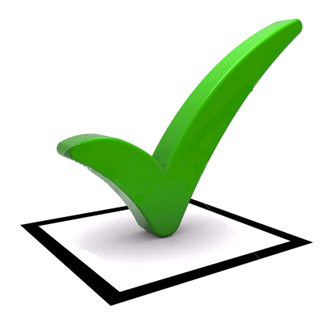 If a recipient is added automatically or is required to un-check a box to opt-out during a process, this method is considered implied and not express consent under CASL. As a best practice this should be avoided anyways as it will typically generate a large volume of emails flagged as spam which negatively affects your reputation as a sender. In order for it to be express consent, a recipient must go through an opt-in mechanism, as opposed to opt-out. The end-user must take a positive action to indicate their consent. Check back as our next post will cover the fine print of CASL and processes that can be used during the three-year transition period in case you are not going to meet the July 1st deadline! Is your firm getting a return on your relationships? Last month we had the opportunity to present on the topic at the ALA Annual conference in Toronto. The session highlighted how to build genuine and lasting business and personal relationships for your firm; as well as how to evolve the impact you have with your prospects and clients. The most common challenges while building relationships is not being sure where to start, a lack of defined processes, and under utilizing technology to assist with creating and maintaining relationships. An easy way to start building genuine relationships is to incorporate relationship management into practice area/group plans as well as introduce individual plans for attorneys. Make sure to provide easy to use templates, ideas on the type of information to send out to stay top of mind with contacts, and set goals to measure success. An easy touch point is to review a client or prospects business and suggest three ways you can help them grow. Coming up with a defined process can be as simple or elaborate as you like, but providing a general framework will help create consistency. It is also key to review relationships and identify where they could be in jeopardy. If someone hasn’t reached out to connect in more than 6-9 months your losing touch with the contact and could be missing out on opportunities. By using technology to assist with relationship management, data can be consolidated and shared throughout your firm. Make sure to evaluate current outreach such as mailings and events and how the firm is capturing that data. 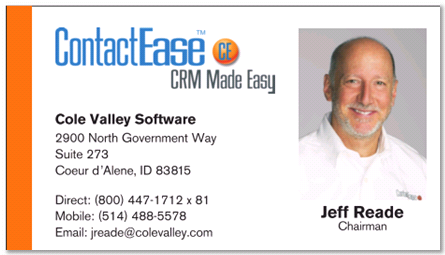 Make sure to utilize Contact Relationship Management Systems to capture the data for a full view of your activities with clients and prospects. If your firm doesn’t have such a system in place make sure to review tools with IT teams and explore different options that are available. It is also important to work with your vendor for an audit of your current system to learn about features and new technology you may not be utilizing. Once data is consolidated it is easier to establish metrics around outreach programs, win/losses on prospecting, and the success of individual plans. Start today by using utilizing existing IT resources for reporting, auditing your technology, capturing processes in writing, implementing pilot groups, and celebrating success. Lastly, make sure to utilize your vendors as a resource. Ask them for latest trends, technologies, and processes to make your firm successful.